Celebrate the 100th year of our Foundation with a glass of Rotary Centennial Wine. 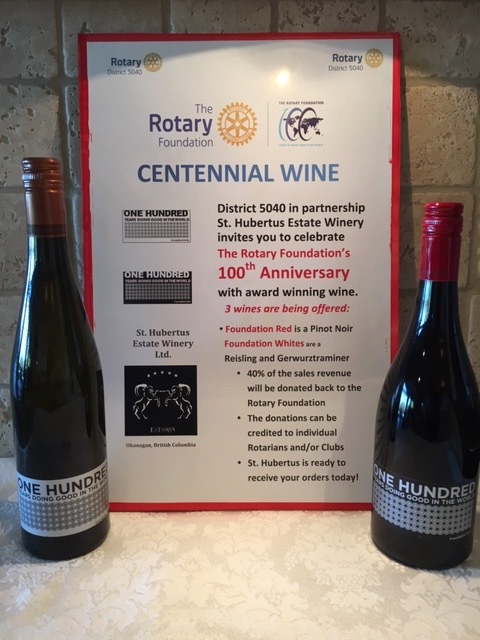 St. Hubertus Estate Winery, based in Kelowna BC, has partnered with District 5040 to their award winning wines with a specially commissioned label to represent our 100th Anniversary of the Rotary Foundation. With every bottle sold, St. Hubertus will donate 40% of the proceeds to our Rotary Foundation. Celebrate with 3 of the St. Hubertus Estate award winning wines: Foundation Red, a Pinot Noir, a Reisling or a Geẅurztraminer. To place your order download the order form and send completed order forms to wine@st-hubertus.bc.ca. Additional information about Rotary Foundation Centennial can be found on the Rotary Foundation Centennial page.